Do you carry a gun in your home? When I was a newlywed, my wife tried to convince me that my habit of wearing a gun at home was unnecessary. “What reason could you possibly have for carrying that at home” she would say. I have one reason for carrying a gun at home. I carry a gun at home because sometimes the Big Bad Wolf knocks on your door (or crawls through your window). Predators are everywhere in society. Statistics show that eventually one will likely cross your path. If a bad guy threatens you or your family, there’s no way in Hades he will let you run to get a gun. A couple of weeks ago in DeKalb County, a predator robbed and kidnapped a Father and his teenage son at gunpoint. The robber asked the teenager for marijuana. After the teenager told the man he didn’t have any marijuana, the man asked the teenager for a cigarette. While the kid was trying to be nice and get the man a cigarette, the robber pulled a gun on him. The robber then entered the teenager’s apartment and robbed the father of his wallet. Alas, the wallet wasn’t good enough. After all, what kind of dirt-bag robs someone without taking full advantage of the situation? I mean, what good is a debit card at the crack store. A dedicated robber will threaten the life of his/her victim for a while longer while making the crucial ATM stops. Cash is king at the crack store. So the robber decided to force the Father to drive all three of them to the local ATM. The idiot robber actually laid his gun down next to him while at the bank. The Father didn’t miss the opportunity. He immediately snatched the gun while his teenage son began choking the predator. The ordeal was finally over for the Father & Son duo when the Father shot the kidnapper 5 times. While the world is a better place without the dirt bag robber walking the streets anymore, the Father & Son will likely have emotional scars that last a lifetime. The point of the story is that the Father was unarmed. He had to wait for a lucky break to survive the robbery. People in this situation rarely get a “lucky break”. Did the robber ask his victims if they needed to grab anything before they ran to the bank? Nope. What if you have guns in every room? Are you safe then? Will an invader of your home take his eyes off you long enough for you to go to a gun? Maybe…maybe not. When I’m at home, I have my handgun on my belt. It’s no different than if I’m at work, at the store, getting gas, etc. We carry a gun because we want to be prepared if a bad guy means to do us harm. Nobody knows when that moment might happen. It might even happen at home. My wife no longer questions my choice to stay armed all day long. In fact, she is now armed all day long as well. We live in a small, quiet town. It’s a great place to raise a family. However every time I see a news story reporting on a home invasion in our perfect little community, I make sure to show it to my wife. It didn’t take too many stories before my point of view seemed more reasonable. 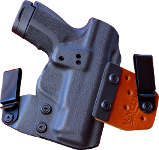 If you have a holstered gun when you answer the door (concealed or open carry), you have a fighting chance against bad guys. 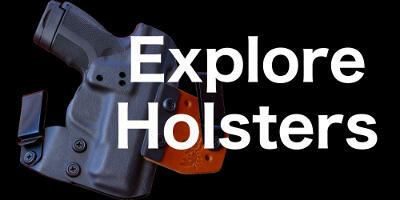 The solution is simple: leave your holster and gun on when you get home. You don’t have to go to the door with a gun in your hand. That freaks people out! P.S. At night a gun safe on your night stand can get you armed quickly if your alarm goes off. As long as your windows and doors are hooked up to your alarm, a home invader will have a hard time getting the upper hand. In most cases, you should be able to arm yourself before he/she makes their way to your bedroom. Do you carry your pistol at home?